Odion Ighalo who plays for Changchun Yatai FC in China scored a hat-trick during the game played on Saturday. “We must continue to support our players and praise them for playing for the country at all times. They have done what is expected of them by going all out to secure the three points in the match and hopefully we expect a good result from the reverse fixture on Tuesday. Though our standard of play was not excellent, hopefully we will see more improvement., ” he said. 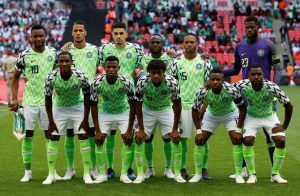 Ekpo noted that there were some lapses in the team’s game at the beginning of the match, saying however that team head coach Gernot Rohr corrected the lapses in the second half of the game. We won with a wide margin which is good, and it shows that the boys are capable of anything. They should keep up the tempo and remain resolute in the other qualifying matches, ” he said. Nigeria will be guests of Libya in their reverse fixture encounter on Tuesday in Tunisia.